The aim is to foster dialogue on topics relating to recycling of industrial products as building materials and on sustainable building construction. “During the design studio, we are investigating several prototypes presenting variable solutions of construction and deconstruction of small inhabitable spaces using the bottles manufactured by Friendship LLC,” said Kallipoliti. According to Alnaggar, the trend in dealing with these plastics is to shred them and then either recycle the material or put it in landfills. Without any additional energy costs to transform the bottles for further use, his research provides additional lives to these bottles as permanent parts in buildings. His students are investigating strength and thermal insulation properties of the bottles for their incorporation into concrete sandwich walls and hollow block slabs to save on materials and energy consumption. “We are taking the bottles from our landfills and putting them sustainably into our structures to reduce weight and provide insulation for a better energy consumption,” he said. After being displayed at Rensselaer, the pavilion will be brought to Industry City in Brooklyn for the WantedDesign event May 17-21. WantedDesign aims to provide a platform dedicated to promoting design and fostering the international creative community at large throughout the year. 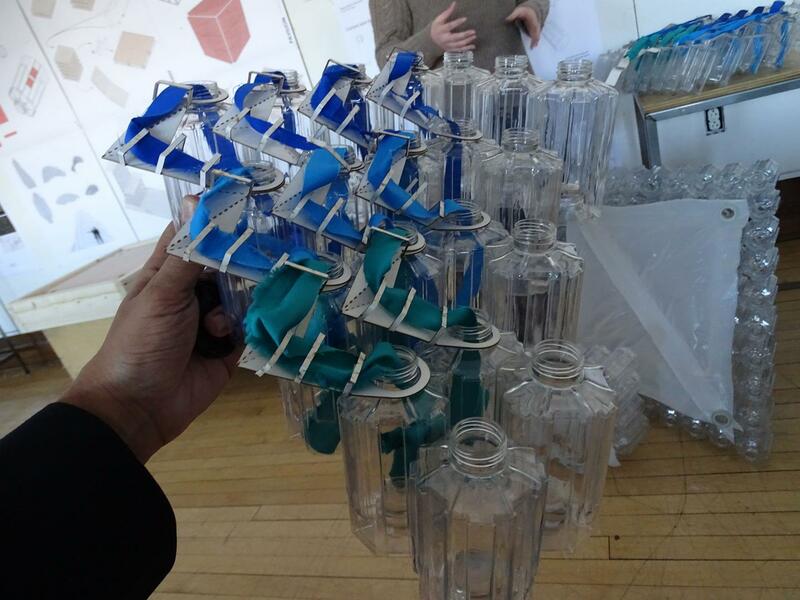 The Rensselaer Center for Architecture Science and Ecology is conducting a complementary investigation to the Second Lives | After Bottles team, focusing on the environmental performance of a transitional shelter. The project’s research goals include environmental sensing and data frameworks for comfort and well-being in transitional shelters; the role of Friendship bottles in waste reduction and reuse within disaster relief logistics; and the use of Friendship bottles as a performative building system. CASE’s transitional bottle shelter test bed will be installed alongside the Second Lives | After Bottles pavilion at WantedDesign Brooklyn 2018. Rensselaer Polytechnic Institute, founded in 1824, is America’s first technological research university. For nearly 200 years, Rensselaer has been defining the scientific and technological advances of our world. Rensselaer faculty and alumni represent 86 members of the National Academy of Engineering, 17 members of the National Academy of Sciences, 25 members of the American Academy of Arts and Sciences, 8 members of the National Academy of Medicine, 8 members of the National Academy of Inventors, and 5 members of the National Inventors Hall of Fame, as well as 6 National Medal of Technology winners, 5 National Medal of Science winners, and a Nobel Prize winner in Physics. With 7,000 students and nearly 100,000 living alumni, Rensselaer is addressing the global challenges facing the 21st century–to change lives, to advance society, and to change the world. To learn more, go to http://www.rpi.edu.